Renowned German director and playwright Roland Schimmelpfennig is inspired by the work of Brecht. His writing clearly reflects this and honouring his style and particular aesthetic, Daniel Clarke’s direction of TheGolden Dragon is responsive and honest. The Lawler Studio is the perfect space for this production. 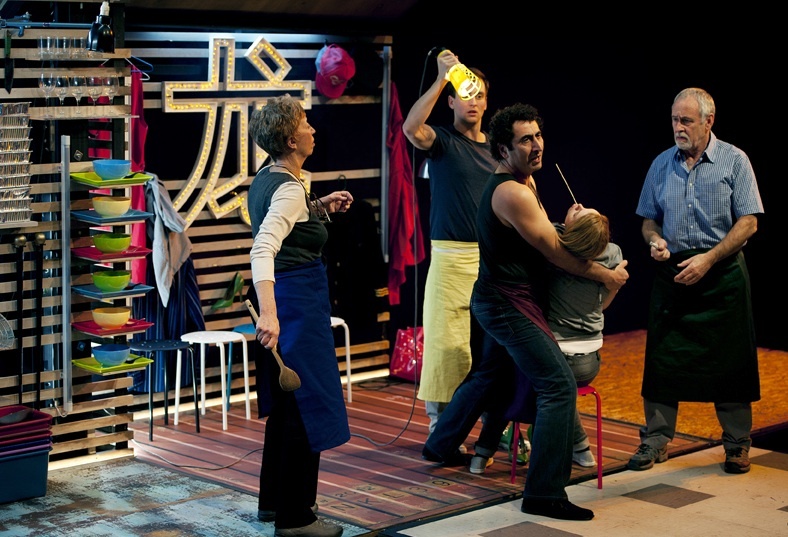 There is no fourth wall, the set literally opens up and the actors deliver the narratives of five Asians in a Chinese/Thai/Vietnamese kitchen in a manner that closely resembles the didactic style of Brecht. Complete with uttered stage instructions (which surprisingly did not distract even after the funny factor subsided) the story is simple: a young member of the kitchen is suffering from a terrible toothache and after it’s extraction bleeds to death. Simultaneously, we are introduced to the personal stories of other staff members and while each character plays multiple roles it is a credit to Clarke’s direction that a simplicity and eloquence were retained which ensured that the different narratives were always equally maintained. The cast gave solid performances and barring a few minor hiccups conveyed with sincerity and candour the starkness of life and its events. Ash Flanders and Jan Friedl were particularly brilliant as the grasshopper and ant respectively and this is another commendation for Schimmelpfennig for weaving in such a well known parable; and to Clarke for executing this so simply and stylistically. Emma Valente’s lighting design certainly deserves a mention as the attention to detail was superb and the aesthetic was highly evocative. Similarly, the Andrew Bailey’s set design also reflected detail, was well thought out and without being cluttered offered a convincing portrayal of an Asian kitchen. A key question that arose early on in the play was: Does race matter? We have four Caucasians playing roles that include characters that are specifically Asian. Yes, of course race matters. But within a play where stereotype simply has no place to manoeuvre, where traditional gender roles are disrupted, and where fortunately accent does not define geographical boundaries, race ceases to be a factor involved in power hierarchies. This does not imply that race doesn’t matter – it simply would be a very different play if indeed all four Asian roles were indeed played by actors who also had ethnic relationships to the character they played. But both versions are legitimate – and in that respect Melbourne audiences are very lucky to have witnessed perhaps the unconventional approach to this production.